This ECG was presented in a conference. The patient had presented many times for SOB. On this occasion he was intubated for respiratory failure due to presumed asthma. I was asked to interpret his ECG in the conference. I had never seen it before. This is what I said: "This is diagnostic of an acute inferior MI. There is upsloping ST elevation in III, with reciprocal ST depression in aVL. You do NOT see this in normal variant STE, nor in pericarditis. The only time you see this without ischemia is when there is an abnormal QRS, such as LVH, LBBB, LV aneurysm (old MI with persistent STE) or WPW." This was not seen by the providers. Now it is more obvious. It is unclear if treating physicians saw this. Inferior MI of indeterminate age. If you see this ECG in isolation, that is true. There are well-formed Q-waves and T-wave inversion. The patient was managed in the ICU and had serial troponins. These were interpreted as due to demand ischemia, or type II MI. Such high troponin I is very unusual in type 2 MI. Sandoval Y. Nelson SE. Smith SW. Schulz KM. Murakami M. Pearce LA. Apple FS. Cardiac Troponin Changes to Distinguish Type 1 and Type 2 Myocardial Infarction and 180-Day Mortality Risk. Acute Cardiovascular Care 2014;3(4):317-325. Notice that the 6 hour value (far right) is very low for type 2 MI. Should Troponin be a Vital Sign? Perhaps, but only if Interpreted Using Pre-test Probability. After admission to the hospital, the patient was discharged from the hospital without any investigation of his acute MI. He returned 5 days later for another episode of SOB, which was again diagnosed as asthma (and probably he also had asthma). Clearly an MI of uncertain age. I looked back at his previous (ECG-2) and his previous troponins and assumed that he had been diagnosed with acute MI a few days ago. This was a wrong assumption. I did not realize that he had NOT had an angiogram. This is more consistent with an old MI with persistent ST elevation. And, in fact, there was no new acute MI at this visit - troponins did not rise again. 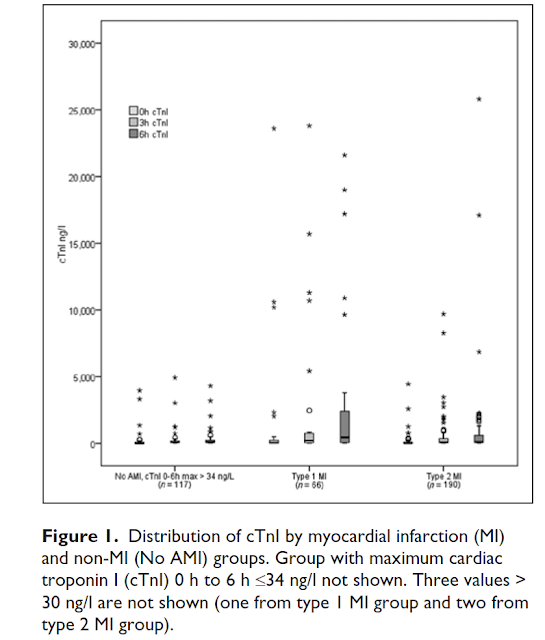 The troponin was 0.224 ng/mL and falling, and thought to be due to demand ischemia again [though they were merely coming down after previous (type 1 MI)]. He was discharged and returned again. At some point he returned with chest pain, and all these findings were put into place. An angiogram confirmed ACS as the etiology. At this point, all vessels were open and the patient was treated medically (with dual antiplatelet therapy). 1. Again, a computer "Normal ECG" is often abnormal. 2. Troponin I greater than 1.0 ng/mL is seldom a result of demand ischemia (type 2 MI). Beware of diagnosing type 2 MI. 4. ANY AMOUNT of STE in lead III, with ANY amount of STD is aVL, in the absence of old MI (inferior LV aneurysm), WPW, LVH, or LBBB is due to acute MI until proven otherwise. Excellent teaching case presented by Dr. Smith regarding how easy it is to overlook an acute STEMI when the history does not suggest this diagnosis, and ECG findings are subtle. I focus my comments on the first 2 tracings shown in this case — which for clarity, I have put together in Figure-1. Figure-1: The first 2 ECGs shown in this case (See text). In my opinion — it is not the fault of the computer that the diagnosis was missed. Instead — it is the fault of the provider who accepts the computer interpretation without independently interpreting the ECG before looking at what the computer said. We have addressed this issue on many occasions in Dr. Smith’s ECG Blog. My views may differ from others — in that as an Attending charged with overreading ECGs for numerous providers — I loved the computerized interpretation once I appreciated what the computer can and cannot do. That’s because the computer saved me LOTS of time (!) by greatly speeding up my interpretation, when I would be confronted with a large stack of ECGs in front of me to interpret. But for anyone who has read less than many thousands of tracings — it is imperative not to even look at the computer interpretation until after YOU have independently interpreted the ECG yourself! Failure to follow this advice will most likely lead to overlooking subtle acute MIs, as occurred in this case. NOTE: I expand on my approach to Optimal Use of Computerized ECG Reports HERE. It should be appreciated that the technical quality of ECG #1 is clearly suboptimal. That’s because there is much baseline artifact in each of the limb leads. In my experience, many clinicians fail to acknowledge the presence of obvious artifact — which can make it dramatically more difficult to recognize subtle acute findings. I’ll emphasize that neither Dr. Smith nor myself had any trouble spotting signs of recent MI in ECG #1 despite the artifact — BUT— when artifact impedes interpretation, and ECG findings are subtle (as they are in ECG #1) — it is best to have a low threshold for repeating the ECG as soon as this is feasible. 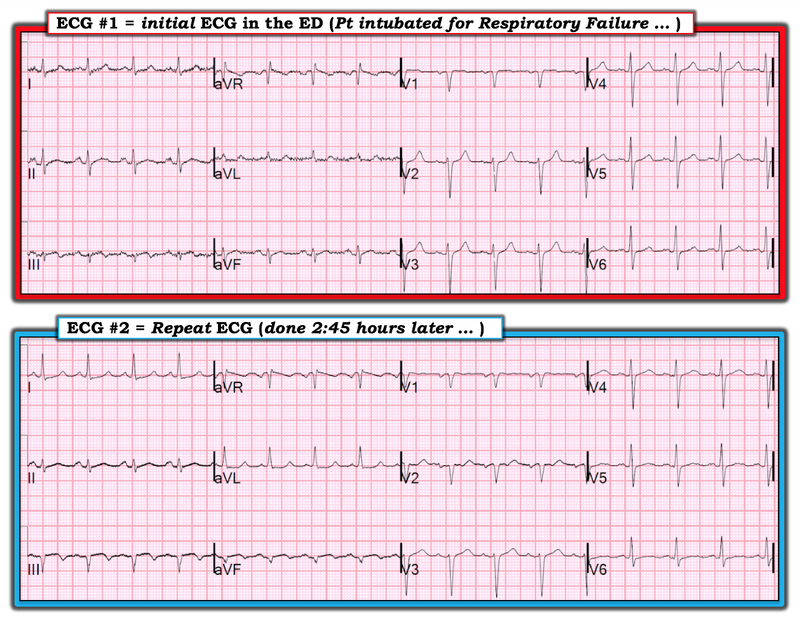 Realizing that you may not be able to eliminate all artifact in an acutely ill patient in marked respiratory distress: i) It is worth a try at a 2nd attempt to get a better quality ECG; and, ii) If an acute cardiac event is in progress — then repeat ECG a few minutes later might now show signs of acute evolution, even if lots of artifact is still present. More than 1/4 of all MIs are not accompanied by chest pain. Of this group (ie, which is comprised of >1/4 of all MIs) — about HALF have NO chest pain at all. The other half ( = >1/8 of all MIs) — have “something else” (ie, some other “non-chest-pain-equivalent” symptom). Among the list of “other non-chest-pain-symptoms” are shortness of breath — GI pain — mental confusion — weakness — myalgias (as in a “flu-like” syndrome) — and simply, “not feeling good”. The most common “non-chest-pain-equivalent” symptom is shortness of breath. This is the reason why through the years I always got an ECG on any middle-aged or older adult patient presenting for emergency care with shortness of breath. Abnormal Findings in ECG #1 — It should be appreciated that no less than 8 of the 12 leads in ECG #1 show abnormalities. So, while the most concerning leads in ECG #1 are leads III and aVL — it is the combination of all of the leads in this tracing with abnormal findings that most heightened my concern. PEARL: Be sure that you always look at all 12-leads on the tracing. Doing so will often “tell a story” by the composite “theme” of abnormal findings. Although difficult to see through the artifact — each of the 3 inferior leads (ie, leads II, III, aVF) show ST segment coving (ie, “frowny”-configuration). As already noted — lead III is the most abnormal of the inferior leads, because it already shows T wave inversion. But, straightening with tendency to downward coving of the ST segment in the other 2 inferior leads (as seen in ECG #1) is not normal. Although tiny in amplitude, and marred by artifact — lead aVL is suggestive of mirror-image ST depression to the ST coving we see in lead III. The other lateral limb lead ( = lead I) shows subtle flattening of the ST segment, with a hint of ST depression. As occurs in this case — reciprocal ST depression in association with acute inferior MI is almost always more marked in lead aVL than in lead I — but in the context of the abnormal appearance of lead aVL in ECG #1 — the ST segment in lead I is not normal. 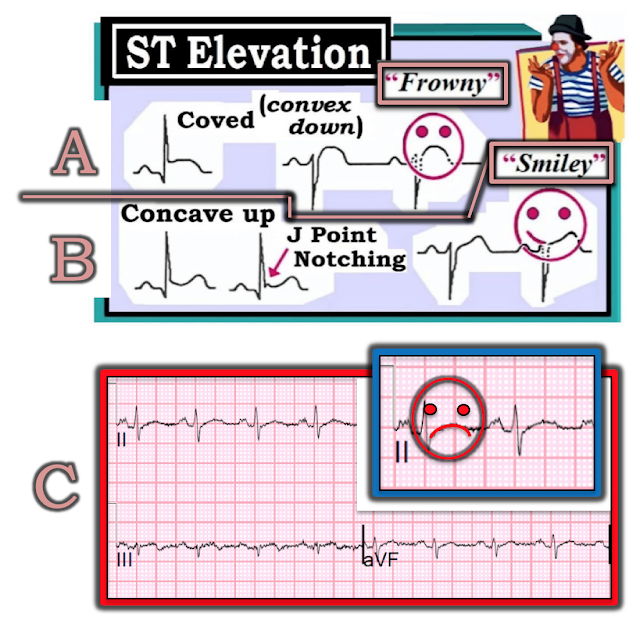 Typically, there is slight concave-up (ie, “smiley”-configuration) ST elevation of 1-2 mm in leads V2 and V3 in normal tracings (See Panel B in Figure-2). Instead — the ST segment (before the T wave) is flatter-than-it-usually-is in both leads V2 and V3 of ECG #1, even though there isn’t frank ST segment deviation. In the context of the abnormal limb lead findings described above — the ST segment (especially in lead V2) is not normal, and to me suggests possibly acute posterior involvement. 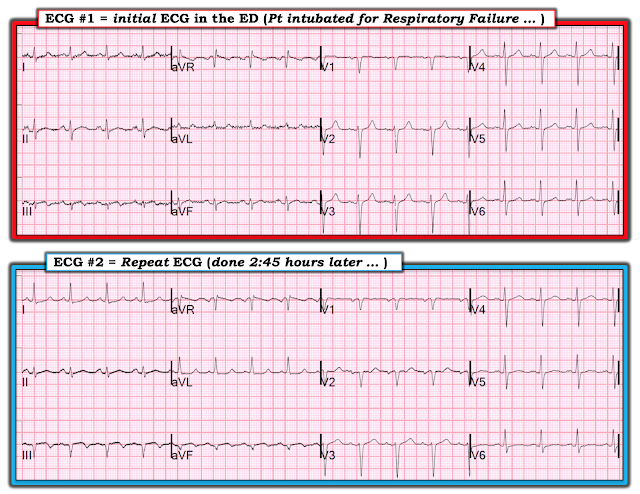 Finally — the T wave in lead V6 of ECG #1 is tiny. This is unusual — and in the context of abnormalities in the other 7 leads — the T wave in lead V6 is not normal. Interpretation of ECG #1: Given the clinical history in this case (ie, No possibility of finding out IF the patient had chest pain — because the patient was already intubated with acute respiratory failure) — I would have interpreted ECG #1 as showing possible infero-postero MI of uncertain age. As an isolated ECG (and, in the absence of a history of new chest pain) — I thought it impossible to “date” this potential MI. The point to emphasize is that the term, “of uncertain age” means that IF there is an MI, that it might be an old MI — or, that it might be a recent MI, that could still be evolving. Clinical correlation + serum troponin values and follow-up ECGs will be needed to sort this out. The artifact impeding interpretation of ECG #1 has resolved — and it is now much easier to interpret the abnormal limb lead findings. There are new large Q waves in leads III and aVF of ECG #2 — with a straightened ST segment takeoff of the elevated ST segments in these leads + T wave inversion now also in lead aVF as well as lead III. It is much easier in ECG #2 to appreciate the mirror-image opposite reciprocal ST-T wave changes in lead aVL, with respect to the ST elevation we see in lead III. It is also much easier in ECG #2 to appreciate some reciprocal ST depression in lead I. Finally — there has been further evolution of the subtle ST-T wave abnormalities in leads V2, V5 and V6 — which now all show definite ST-T wave flattening in ECG #2. Figure-2: Descriptive analysis terms regarding ST elevation (See text). ADDENDUM: Descriptive analysis of ST-T wave changes can be confusing. The terms, “concave up” and “convex down” are often used to describe the shape of elevated ST segments. I was taught that the shape of the ST segment in Panel B of Figure-2 reflects ST elevation with an upward concavity — as compared to the shape of the ST elevation in Panel A, which is convex down. For clarity when communicating among colleagues — I favor use of the descriptive terms, “smiley” configuration (which would be concave up, by the terminology I was taught) — and “frowny” configuration (which corresponds to convex down by the terminology I was taught). I also like the descriptive term, “coved” — to reflect a “frowny”-shaped ST segment. Clinically — the importance of ST segment SHAPE cannot be overstated! In general — smiley-shape ST elevation is more likely to be benign (as is commonly seen with repolarization variants) — whereas ST segment coving is more likely to reflect an acute process. NOTE: Many exceptions to this generality exist! Space constraints here don’t permit full discussion of these exceptions. My point is simply that ST segments in each of the inferior leads of ECG #1 (shown in Panel C of Figure-2) suggest a tendency to ST segment coving, which is not a normal ST segment shape in the inferior leads. This is best seen by the imaginative “frowny” configuration, which I have superimposed on the magnified lead II ST segment. This is an example of subtlety at its finest! And great discussions. Chronic pulmonary patients can be very difficult to diagnose because 1) as in this case, cardiac compromise may present as shortness of breath instead of chest pain, 2) when they do have chest pains, they are often due to non-cardiac factors and 3) their mean QRS axis is almost always very posterior making it more perpendicular to the frontal plane. This results in small (more difficult to interpret) deflections in the limb leads and larger deflections in the precordial leads. Whenever you see deflections that appear unexplainable on the ECG of a chronic lung patient, don't forget that the mean QRS axis exists in THREE - not TWO - dimensions and that every axis has TWO perpendiculars - not just ONE! Regarding the convex up/concave down dilemma, I just think of everything as "up": "concave up" or "convex up." I never use the word "down." A Pathognomonic ECG. What is it? What is this rhythm? And what else does it show?